Woodbridge, VA-For the second straight game, the Potomac Nationals (3-4) failed to plate a run, as the Carolina Mudcats (5-2) won 2-0 on Wednesday night and earned a series sweep. 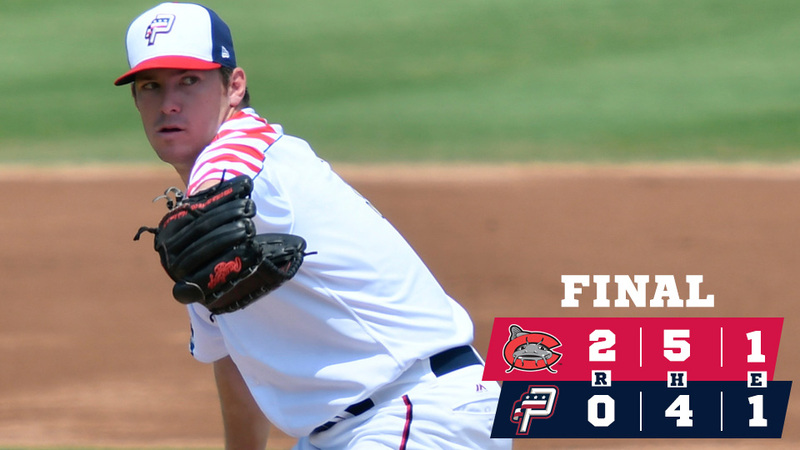 In a bounce back pitching performance, RHP Kyle Johnston (L, 0-2) allowed a run in the opening frame, but kept Carolina off the scoreboard over the next five innings, as he tallied Potomac's first quality start of the season. The P-Nats' offense had plenty of opportunities, though finished 0-10 with RISP and left 12 runners on base. Johnston issued a one-out walk to 1B Ryan Aguilar in the opening frame, and he crossed the plate on a two-out, two-strike double from C Payton Henry. Henry's double gave Carolina a 1-0 lead, which proved to be enough. Johnston allowed just one more hit and struck out five over six innings. Potomac's first two batters of the night, 2B Cole Freeman and DH Telmito Agustin , walked off of RHP Bowden Francis (W, 1-0), but were both left in scoring position. Potomac left two men in scoring position in the second inning, a runner on second base in the fourth frame, two men in scoring position in the fifth inning, and the bases full in their eighth trip to the plate. Bowden allowed three hits over five innings in the victory. After six strong innings from Johnston, Potomac went to the bullpen. RHP Frankie Bartow worked a scoreless seventh inning, but allowed a solo home run to CF Joantgel Segovia, which began the eighth inning. Segovia's second home run in as many games made it 2-0 in favor of Carolina, the eventual final. First pitch in Winston-Salem on Thursday night is set for 7:00pm. The Potomac broadcast will get underway at 6:45pm with the P-Nats Leadoff Show. You can listen to the Potomac broadcast at potomacnationals.com, at http://bit.ly/P-NatsBroadcast, or on the TuneIn Radio App.